Spanish general Jose Aranguren was shot on this date in 1939 by Franco’s Spain. 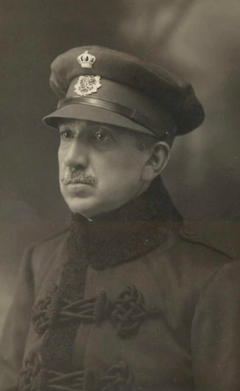 A brigadier general of the Civil Guard — an internal-to-Spain paramilitary/law enforcement force that remained predominantly loyal to the Republic during the Spanish Civil War — Aranguren (the very cursory English Wikipedia entry | the more detailed Spanish) at the outset of hostilities efficaciously suppressed the Nationalist rebels in Barcelona and even gave evidence that contributed to the execution of his mutinous opposite numbers. From 1937, he served as the Republican military governor of Valencia. He eschewed the opportunity to flee Spain at the end of the war, counting on his faithful adherence to his plain duty to vindicate himself against the fascists. On this date in 1939, the Old Bolshevik Aleksei Gastev, a theorist of scientific management for the Soviet state, was shot in Stalin’s purges. Expelled in his youth from tsarist teaching ranks due to his radicalism, Gastev (English Wikipedia entry | Russian) traced his revolutionary bona fides back to the 1905 Revolution (he fought in it) and even before (as an ally and correspondent of Lenin). 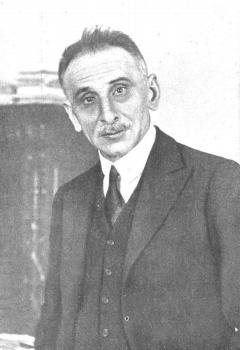 With the advent of the latter’s revolution, Gastev founded the Central Institute of Labor (CIT), and CIT’s training firm Ustanovka (“setup” or “installation”) — organs dedicated, respectively, to the study of work, and to the promulgation of the new science of the workplace throughout the Soviet economy. 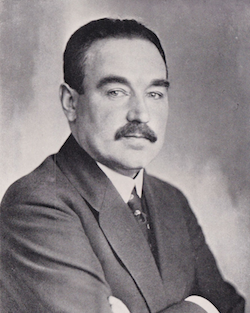 It was a socialist perspective on Taylorism, that practice of scientific management that was also transforming capitalist production; like Taylor, Gastev aimed to systematize the routine operations on the factory floor, to learn the most efficient way to wield a hammer or a shovel and expel from the labor force the indulgence of artisanal idiosyncracy and rule-of-thumb work; more broadly, Gastev aimed to revolutionize the way work was conceptualized by Soviet people, bending the mental and behavioral orientation of workers to optimize them for the demands of industrial production. Fear of this very thing haunted Europe in this moment and has never left her nightmares in the century since. The CIT juxtaposed curiously with the almost simultaneous publication of some of the seminal dystopian mechanization literature — like Yevgeny Zamyatin‘s We (1921), in which the rational ordering of society annihilates freedom, and Karel Capek‘s R.U.R. (1920), the play that borrowed a Czech term for unfree work to give the world’s lexicon that wonderful word “robot”. Unsettling to many, this twining of man and machine was understood by Gastev as an emancipatory vista. 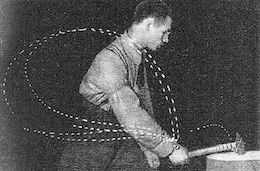 Gastev’s ideal worker is neither the oxen brute of Taylor’s dreams, nor the lifeless robot of Capek’s nightmare. He is rather an active, sentient, and creative part of the productive process who behaves like a seasoned, conscious, and well-trained warrior. Armed with sharpness of vision, acute hearing, attentiveness to environment and detail, precision and even grace of movement, and “scoutlike” inquisitiveness about the relationship and locations of things and peoples, he enters the factory as though it were a battle-field with commander-like briskness, regimental routine, and a martial strut. For him, no romance, no heroic individual deeds — only a relentless battle waged scientifically for production. Dziga Vertov‘s 1929 classic Man with a Movie Camera captures the excitement of industrialization and industrial workers. The chronometer stopped for Gastev with his fall in late 1938, and he proceeded thence to the familiar fate of Stalin’s prey amongst the intelligentsia. As he associates with the positive, modernizing, and utopian strain of the Soviet experiment but not its failures or horrors his name is not blackened to posterity and the present-day Russian Federation’s Ministry of Economic Development sponsors an “A.K. Gastev Cup” award to honor advances in production. 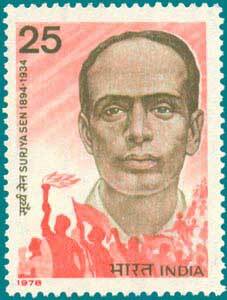 On this date in 1934 the great Bengal revolutionary Surya Sen was hanged by the British. A schoolteacher affectionately known as “Master Da”, Sen put his name in the annals by leading the April 18, 1930 raid on the Chittagong police armory,* which yielded benefits more symbolic than practical: it was hoped that the raid would also surprise and massacre the local British officer corps and trigger a whole rising, but the prospective targets were absent, and then became forewarned, on account of the raid taking place on Good Friday. Afterwards, the rebels melted away and the wanted Sen stayed underground for years. It’s no wonder he was hard to catch: the guy who finally betrayed him was beheaded in revenge. “Death is knocking at my door,” ran the man’s letter before he went to the Chittagong Central Jail along with another revolutionary named Tarakeswar Dastidar. My mind is flying away towards eternity … At such a pleasant, at such a grave, at such a solemn moment, what shall I leave behind you? Only one thing, that is my dream, a golden dream-the dream of Free India … Never forget the 18th of April,1930, the day of the eastern Rebellion in Chittagong … Write in red letters in the core of your hearts the names of the patriots who have sacrificed their lives at the altar of India’s freedom. * Armories, actually: two separate facilities, one for the police and one for the auxliaries, plus the European Club where they intended to seize hostages. The modern republic of Turkey executed a woman for the first time in 1931. Fatma Demir (German Wikipedia page: there’s none on Turkish Wikipedia) broke the Ramadan fast with a friend whom she bludgeoned with an ax handle during a prayer. It seems that it was at the instigation of others, like the victim’s husband and that husband’s mistress, both of whom helped Demir sink the body in a river. Her hanging took place in public. There’s a 2013 Turkish-language documentary about her case, titled Dar Agacina Takilan Düsler (Dreams Hanged from the Gallows). Italian Communist Vincenzo Baccala was executed on this date in 1937 … but not by the fascists. The blackshirted turn of his country in the 1920s had driven Vincenzo into emigre exile, pursued by an in absentia prison sentence for “subversive propaganda tending to insurrection and incitement of class hatred.” He went first in Paris and then in 1931 to the USSR. 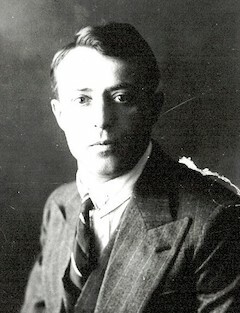 Although present in the fortress of Communism at the Party’s direction, and eventually an outright Soviet citizen, Baccala came into trouble after criticizing Stalin in 1933 and had to leave his family in Odessa as he struggled to find work. Come the height of the purges in the later 1930s, he was predictably denounced. Baccala’s wife Pia Piccioni swallowed a bitter draught of her own; unable to see her husband or find support amid Stalin’s purges, she returned to her native country, finding little comfort either in Mussolini‘s Italy (for obvious reasons) or in postwar Italy (where red comrades shied from traducing the USSR). She wrote a book about her own and Baccala’s experiences, Compagno Silenzio: Una vedova italiana del gulag racconta. 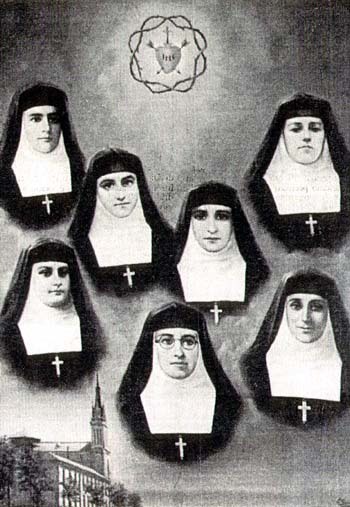 These sisters of Catholicism’s Visitandine or Visitation Order were the last remaining to watch over their convent, which had been mostly evacuated for fear of anti-clerical violence in the unfolding Spanish Civil War. Indeed, even these seven felt it wiser to stay in a nearby apartment where they secreted the convent’s treasures and kept their holy orders as quiet as possible. Their precautions were justified — but insufficient. On the night of November 17, weeks after the Spanish capital was besieged by the Francoists an anarchist militia tossed the place, interrogated them, and then returned the next day to have them summarily executed on the outskirts of town. * Technically, only Sisters Gabriela de Hinojosa, Teresa Cavestany, Josefa Barrera, Ines Zudaire, Engracia Lecuona, and Angela Olaizola were shot on the 18th. Sister Cecilia Cendoya escaped her captors but later turned herself in and obtained the crown of martyrdom a few days afterwards. On this date in 1938, Kyrgyz intellectual and statesman Kasym Tynystanov was executed during Stalin’s Great Purge. Kasym Tynystanov, on modern Kyrgyzstan’s 10-som bill. Born in tsarist Russia’s mountainous frontier with Qing China, Tynystanov (English Wikipedia entry | Russian | Kyrgyz) was blessed by the exertions of his father and a local mullah with literacy — a gift shared by only about one in 40 of his countrymen. He graduated from the Kazakh-Kyrgyz Institute of Education in Tashkent in 1924 and went on to a career in letters — literal letters, as he’s credited with being the first to regularize the Kyrgyz tongue in Latin characters. He would publish several works on the Kyrgyz language; he also compiled the oral folklore of his people, and wrote verse of his own. Tynystanov served as People’s Commissariat of Education and chaired the language and literature organ of the Kyrgyz Research Institute of Culture. In 1938 he received Stalinism’s customary reward for the conscientious public servant and was accused as a counterrevolutionary nationalist and shot. The Soviet Union officially rehabilitated him in the post-Stalin era. On this date in 1936, the Spanish politician Melquíades Álvarez was shot by the Republicans. A centrist who disdained “two equally despicable fanaticisms … red fanaticism and black bigotry,” Alvarez (English Wikipedia entry | the more comprehensive Spanish) fell into the chasm torn by the Spanish Civil War. The Gijon-born former barrister noted for his oratory had been in public life as a liberal back to the last years of the 19th century and in 1912 co-founded the Reform or Reformist Party. Although sympathetic to the democratic aspirations of the Republican movement, the Reform Party was cool to forcing a confrontation with Spain’s monarchy. He was briefly president of the Congress of Deputies before the military coup of Primo de Rivera. Alvarez opposed Primo, judiciously. I recalled many years ago going to see another vacillating Liberal, the unfortunate Melquiades Alvarez, after he had ventured to criticise Primo at a public dinner. He was shivering in a travelling rug waiting to be arrested while he told with pride that he had made his speech in such guarded, euphemistic and even allegorical terms that no one would have been quite sure what he meant. He vacillated to the end and now the militia have shot him in the Carcel Modelo. 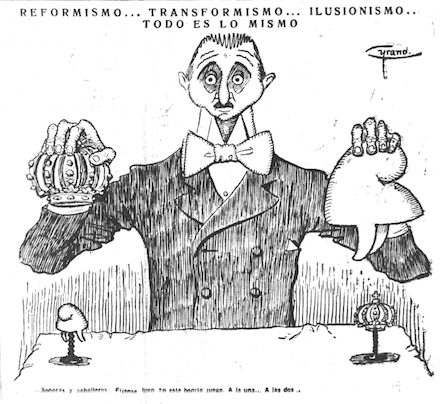 By the onset of the Republic in the 1930s, Alvarez’s institutionalism and anti-Marxism had his political tendency drifting rightwards in a revolutionary era, to the extent of actually joining the conservative coalition known as CEDA. Alvarez would surely have said that the Republic left him; a liberal to a fault, he even in these years defended the son of Primo de Rivera when this founder of the fascist Falange was arrested for conspiring to overthrow the Republic. So the start of General Francisco Franco’s rebellion in 1936 found Alvarez in Madrid as a center-right parliamentarian — right in the path of a sharp political repression immediately leveled by the Republicans against perceived internal enemies. Alvarez and other right-leaning politicians were arrested in early August. Many, like Alvarez, were eventually shot by Republican militias after the barest of legal proceedings.